Creating an iPhone backup is essential. Most iPhone owners do create backups regularly. A common question that most iDevice users ask themselves is, “should I encrypt iPhone backup?”. In this article, we will help you figure out whether encrypting your backup is a good idea. We will also show you an ideal way to decrypt your iDevice backup if you forget your encryption password. Part 1: What is an Encrypted Backup? Part 2: Should I Encrypt iPhone Backup? 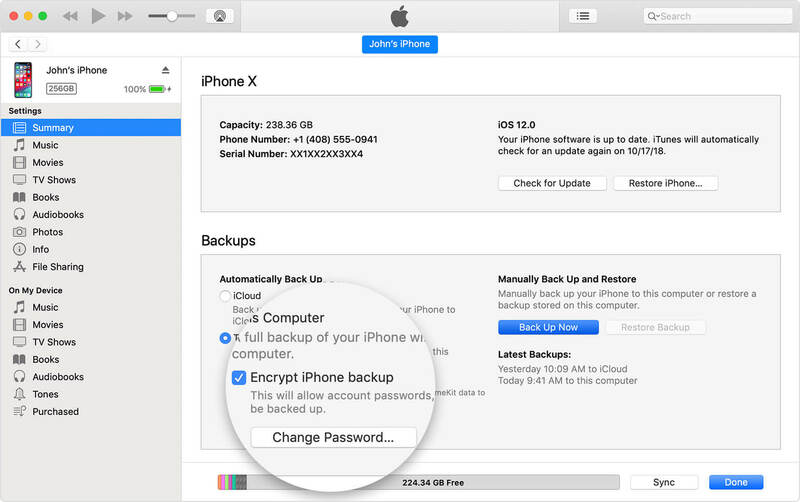 Part 3: How to Encrypt and Decrypt iPhone Backup? Part 4: Can I Decrypt iPhone Backup without Password? What is an Encrypted Backup? When you encrypt your iPhone backup, your data gets encoded and locked. Behind the scenes, an algorithm developed by Apple scrambles your data into an unpredictable unique format. This increases data security. The only person who can access the data is the individual with the encryption password. 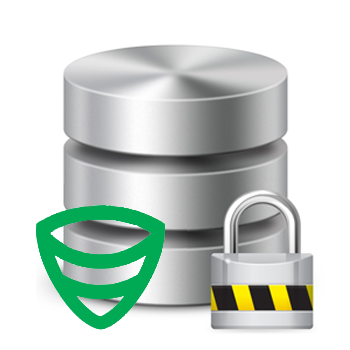 This means that when you encrypt your backup, you prevent unauthorized access. Even if someone manages to access your hard drive, where the backup is stored, he or she will not have the ability to access your data. Should I Encrypt iPhone Backup? Why You Should Encrypt Your iPhone Backup? Security is the most obvious reason why the answer to the question “should I encrypt iPhone backup?’ should be yes. When you encrypt your backup, it will be impossible for anyone who doesn’t have your password to access your personal data. There are non-security reasons why encrypting the iTunes backup is important. If you fail to encrypt your iTunes backup, iTunes won’t back up your passwords, Wi-Fi Settings, Website history, and health data. If you want this information to be included in your backup, you will have to encrypt it. Why You Shouldn't Encrypt Your iPhone Backup? As mentioned earlier on, encrypting an iPhone backup does require an additional password. If you forget the password, using the backup may be hard. If you are not sure whether you can recall your backup encryption password, it is always a good idea to avoid encrypting it. It is worth noting that deleting your encrypted backup and creating a new one will not work without the encryption password. The only option you may have is to either set up your device as new after restoring it or use a third-party tool to decrypt your backup without a password. How to Encrypt and Decrypt iPhone Backup? Using your USB cable, connect your iPhone to your computer. Launch iTunes. Allow the iPhone to sync normally. Select the device on iTunes and then click Summary. 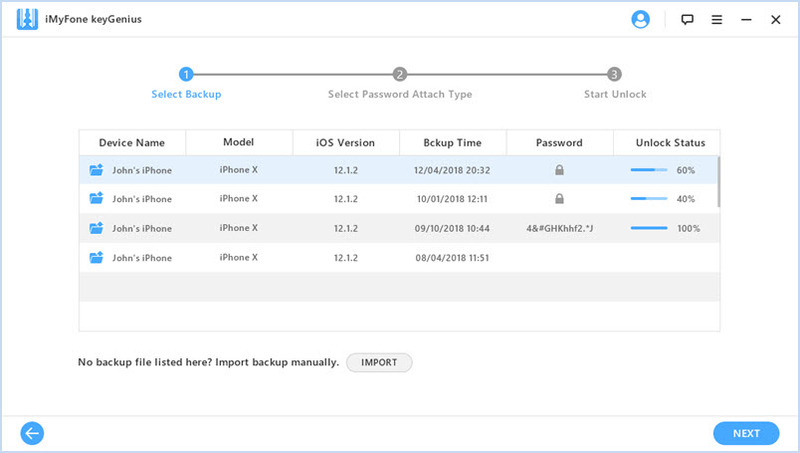 Under Backups, tick the checkbox for “Encrypt iPhone Backup”. Create a password you can recall and confirm it. Wait while iTunes creates the encrypted backup. After the backup creation, visit Preferences from the toolbar on iTunes and then select Devices. If the encryption was a success, you will see a lock next to the backup. If none of the methods outlined above work for you, you can use KeyGenius which guarantees you a 100% success rate. From the menu, select your iPhone and then tap Summary. Under Backups, uncheck “Encrypt iPhone Backup”. Enter your encryption password and then allow the backup process to finish. Can I Decrypt iPhone Backup without Password? Maybe after asking yourself the question, “should I encrypt iPhone backup?” you decided to encrypt the backup. 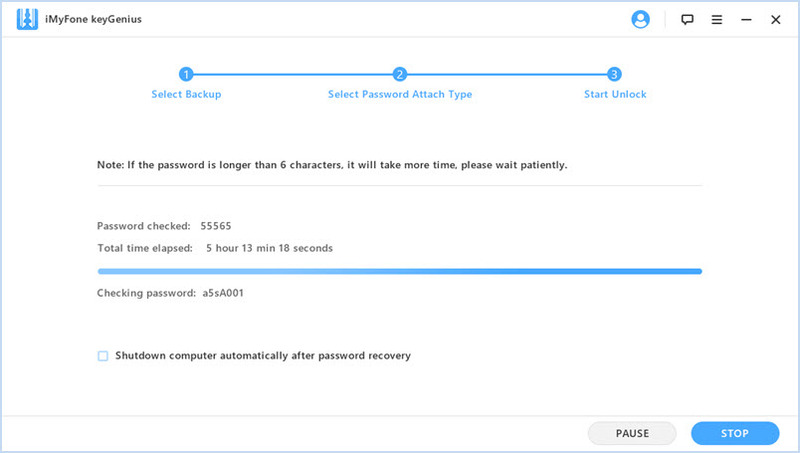 Later, when you decided to restore your backup, you realized that you cannot recall the password. Nowadays, you can decrypt your iTunes backup without a password. All you need is a tool known as iMyFone KeyGenius. KeyGenius works with all iTunes versions, including iTunes 12.9. It has 3 attack methods which guarantee its users 100% success rate. iTunes does have bugs. In some instances, it may not recognize the correct password. KeyGenius can be useful in such a scenario. Also, if you find that iTunes is demanding for a password that you never set (this does happen), you can use KeyGenius to solve the problem. The tool makes unlocking encrypted backups without a password extremely easy. It features 3 powerful attack modes which guarantee 100% decryption rate. The tool can help you remove the current backup encryption settings in 5 seconds. This allows you to create new backups without encryption. You do not require any technical knowledge to use KeyGenius. Step 1: After launching the tool, select "Unlock iTunes Backup". Step 2: Then, you will need to select the encrypted backup file you intend to decrypt without a password. You can import the backup file. 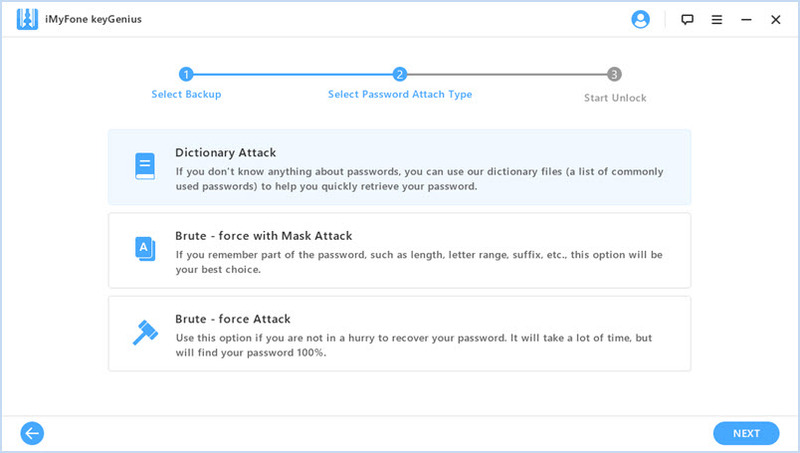 Step 3: Select the ideal attack method from the 3 methods available. The method you select will be dependent on your specific situation. Step 4: Tap “Start” to or recover the encryption password. 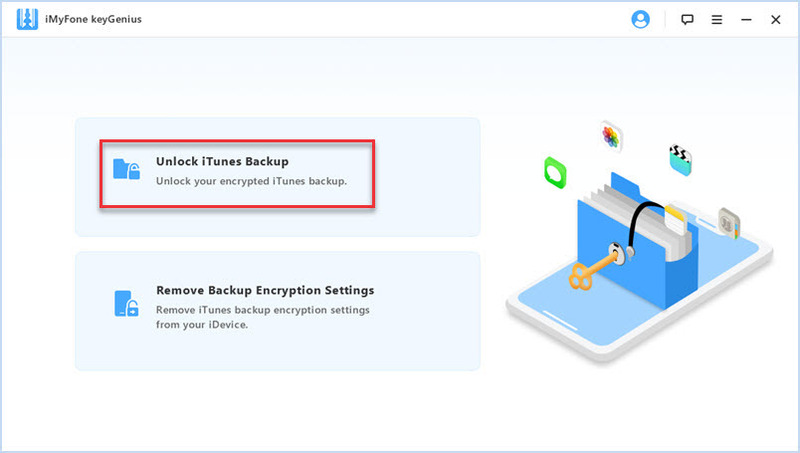 If you have been asking yourself the question, “should I encrypt iPhone backup?”, this article helps you figure out the answer. If you do decide to encrypt your backup, you have to ensure that you can recall the password. Without the password, decrypting the backup can only be done with a third-party tool known as KeyGenius. KeyGenius is extremely easy to use. You will only need to follow 3 simple steps. We have outlined the steps above. You won’t require any technical knowledge. KeyGenius attack modes guarantee its users 100% success rate.